∙ February-March. "Guillermo Ferrer Crónica Pictórica". Ocean Drive Venezuela. ∙ Open theme drawing, sculpture and graphic courses at the School of Plastic Arts Cristobal Rojas, Caracas, Venezuela. ∙ Open theme drawing with the plastic artist Pedro Centeno Vallenilla, Caracas, Venezuela. ∙ Courses of graphic arts at the Graphic Teaching Center CEGRA Caracas, Venezuela. ∙ Deterioration and conservation of monuments and objects of art that contain metal components at the Regional Subject UNESCO of the sciences of integral conservation of cultural goods for Latin America and the Caribbean CRECI, Institute of Cultural Patrimony Villa Santa Inés, Caracas, Venezuela. ∙ Historical techniques of mural painting at the Regional Subject UNESCO of the sciences of integral conservation of cultural goods for Latin America and the Caribbean CRECI, Institute of Cultural Patrimony Villa Santa Ines, Caracas, Venezuela. ∙ IIIX Auction to benefit FUNDANA, Foundation Friends of the Child that merits protection, Ciudad Banesco, Caracas, Venezuela. ∙ Innovative Art Gallery, Mall Paseo el Hatillo, Caracas, Venezuela. ∙ Gallery Limited Edition, Mall Galería los Naranjos, Caracas, Venezuela. ∙ Gallery Limited Edition, Mall Paseo el Hatillo, Caracas, Venezuela. ∙ IIX Auction to benefit FUNDANA, Foundation Friends of the Child that merits protection,Ciudad Banesco, Caracas, Venezuela. ∙ Exhibit, Art with Heart auction to benefit children with disabilities, Art Gallery Innovador, C.C. Paseo el Hatillo, Caracas, Venezuela. ∙ Auction IX to benefico fundana, Banesco City, Caracas, Venezuela. 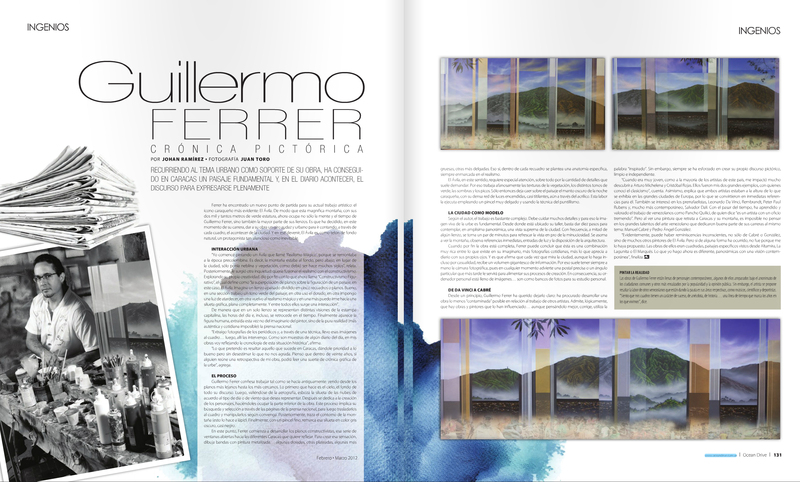 ∙ Limited Edition Gallery, Mall Galleries Los Naranjos, Caracas, Venezuela. ∙ Limited Edition Gallery, Mall Paseo El Hatillo, Caracas, Venezuela. ∙ Gallery Roses and Something Else/Art zone Mall Galleries Prados del Este, Caracas, Venezuela. ∙ 100 percent eclectic and something else, Roses Gallery / Art Zone, Mall Galleries Prados del Este, Caracas, Venezuela. ∙ Auction to benefit VII Fundana, Banesco City, Caracas, Venezuela. ∙ Landscapes in Reflection, Florida Art Gallery, Caracas, Venezuela. ∙ Hatillarte, Night Gallery, Eighth notes and Emotions, Innovative Art Gallery, El Hatillo, Caracas, Venezuela. ∙ Contrast 4 artists 4 proposals, Roses and more Gallery / Art Zone, Mall Galleries Prados del Este, Caracas, Venezuela. ∙ Undulations, Innovative Art Gallery, Mall Paseo El Hatillo, Caracas, Venezuela. ∙ Limited Edition Gallery at C.C. San Ignacio, Caracas, Venezuela. ∙ Limited Edition Gallery at C.C. Los Naranjos Gallery, Caracas, Venezuela. ∙ Limited Edition Gallery at C.C. el Hatillo, Caracas, Venezuela. ∙ Expresarte Gallery at C.C. Casa Mall, Los Naranjos, Caracas, Venezuela. ∙Apriori Art Gallery, Ciudad de Pánama, Pánama. ∙ Pixelesbooks, GBARTS GALLERY, Caracas, Venezuela. ∙ Limited Edition Gallery at C.C. Galerias Los Naranjos, Caracas, Venezuela. ∙ D´Art Gallery, Altamira, Caracas, Venezuela. ∙ Limited Edition Gallery at C.C. El Tolón, Permanent exhibition, Caracas, Venezuela. ∙ Novartis XXIII Collective exhibition ART AND SCIENCE, Caracas, Venezuela. ∙ D´Arte Gallery, collective exhibition VENEZUELA MINE, Altamira, Caracas, Venezuela. ∙ Bortot gallery, Caracas, Venezuela. ∙ Novartis XXII collective exhibition COVERED SPACES, Caracas, Venezuela. ∙ Bortot Gallery 3VISIONS, Caracas, Venezuela. ∙ D´Arte Gallery collective exhibition APRIL-MAY, Altamira, Caracas, Venezuela. ∙ Giacoff Space, Architects Center, PIXELS, Las Mercedes, Caracas, Venezuela. ∙ Liberarte, exhibition MINIMAL EXPRESION, Caracas, Venezuela. ∙ Exhibition of Actual Art SAINT LUCYS EVENING, Maracaibo, Venezuela. ∙ 1800 Gallery, exhibition THE KISS from the Group of Drawing of Caracas, Las Mercedes, Caracas, Venezuela. ∙ Art 3 Gallery exhibition COLLECTIVE 2005, Las Mercedes, Caracas, Venezuela. ∙ San Francisco Center of Art, exhibition TRANSACTION, Las Mercedes, Caracas, Venezuela. ∙ D´Arte Gallery, exhibition COEXISTING ART, Altamira, Caracas, Venezuela. ∙ 1800 Gallery, exhibition EROTICA, Las Mercedes, Caracas, Venezuela. ∙ The Space, exhibition THE CARIBBEAN TUNE (SON) AND THE COREAN ZEN, Las Mercedes, Caracas, Venezuela. ∙ 1800 Gallery, exhibition EXINOX, Las Mercedes, Caracas, Venezuela. ∙ Hyder Gallery, exhibition from the Group of Drawing of Caracas, Philadelphia, USA. ∙ Art 3 Gallery, Caracas, Venezuela. ∙ La Cuadra, Center of Art, Caracas, Venezuela. ∙ Zero Gallery, Caracas, Venezuela. ∙ La Cuadra, Center of art, exhibition THE VIEW IN SMALL AND MINIMUM FORMAT, Caracas, Venezuela. ∙ The House of Latin America, CONCEPT NATURE AND GESTURES IN VENEZUELAN PLASTICS, Bucarest, Rumania. ∙ La Cuadra, Center of Art, exhibition CREEKS, Caracas, Venezuela. ∙ Art 3 Gallery, exhibition INFORMAL COLLECTIVE, Caracas, Venezuela. ∙ La Cuadra, Center of Art, INFORMAL COLLECTIVE, Caracas, Venezuela. ∙ Auction of the Arturo Michelena Foundation, Valencia Athenaeum, Venezuela..
∙ 54 Salon of Visual Arts, Arturo Michelena, Valencia Athenaeum, Venezuela. ∙ Minotauro Gallery, Caracas, Venezuela. Individual Exposition. ∙ 53 Salon of Visual Arts, Arturo Michelena, Valencia Athenaeum, Venezuela. ∙ Arri Art Gallery, El Hatillo, Caracas, Venezuela. ∙ Minotauro Gallery, Altamira, Caracas, Venezuela. ∙ Euroamerican Art Center, exhibition CUPART, Caracas, Venezuela. ∙ Miniatures Biannual, TAGA, Caracas, Venezuela. ∙ Government salon of the Federal District, Bolívar Plaza, Caracas, Venezuela. Individual Exposition. ∙ X Salon of Art of Aragua, House of Culture, Maracay, Venezuela. ∙ French Alliance, La Castellana, Caracas, Venezuela. ∙ Drawing Section, La Rinconada Museum of Art, Caracas, Venezuela. ∙ Graphic Art Section, Room CADAFE, at the extention of the Museum of Modern Arts, Caracas, Venezuela. ∙ Arturo Michelena Salon, Valencia Athenaeum, Venezuela. ∙ Collective of the Graphics Learning Center CEGRA, Caracas, Venezuela. ∙ French Alliance, Los Caobos, Caracas, Venezuela. Individual Exposition. ∙ First National Salon of Young Artists, Museum of Modern Arts, Caracas, Venezuela. ∙ Premio Único de Artes Gráficas, X Salón de Arte de Aragua, Casa de la Cultura, Maracay, Venezuela. ∙ Scenery painting for the project GIANT WOMAN, Spain. ∙ Street Mural Painting, called SUBMARINE ALLEGORIES, Soublette Avenue, Vargas State, Venezuela. ∙ Principal assistance in the making of mural paintings of Baseball Museum, for the Baseball Museum Sambil Valencia, Venezuela. ∙ Principal assistance in the making of mural paintings of Andes, Jungle, Savanna and Coast, for the Venezuelan Pavilion at the Expo HANNOVER 2000, Germany. ∙ Principal assistant for the making of Mural paintings of Dioramas of Jungle and Tepuy at the Museum of Natural Science of Caracas for the exhibition ORINOCO, Caracas, Venezuela. ∙ Historical Mural Recreation of the original mural paintings of Nuevo Circo (1919), Caracas, Venezuela. ∙ Elaboration of the Venetian Stucco of the triptych Salon of the Federal Palace, Caracas, Venezuela. ∙ Elaboration of the Venetian Stucco of the Coat of Arms Salon at the Federal Legislative Palace of Caracas with the restoration office of the Federal Palace for the Institute of Cultural Patrimony, Caracas, Venezuela. ∙ Restitution of Decorative Mural Paintings of old Veroes Casona, Actual Headquaters of the Historical Center of Investigations of Venezuela, Polar Foundation, Caracas, Venezuela. ∙ Restitution of Decorative Mural Paintings from the Protocol Spaces of the Villa Santa Inés, original House of the Expresident Joaquin Crespo (1885), actual headquarters of the Institute of Cultural Patrimony, Caracas, Venezuela. ∙ Restoration of Mural Paintings of the Ceiling at the Baralt Theater of Maracaibo with the architect Pablo Donja, Maracaibo, Venezuela.